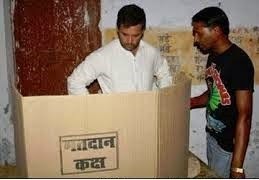 According to the rules of Election commission of India no candidate can even enter inside the voting room but our young congress candidate with hot blood had not only entered the voting room but he was sitting near the EVM's where the voters should be alone and are having full privacy regarding there vote. The incidents had taken place not only at a single place Rahul Gandhi was found breaking Election commission rules at two polling booths one is Asthabhuja school , kura and second one is a High school at Phura. And he was found very near to the EVM (Electronic voting machine).Aam aadmi party (AAP) had also raised questions from Election commission of India regarding this incidence and even said this that "If any other candidate had done this that till now it would had become a very big issue". Election commission of India agrees that what Rahul Gandhi had done at Amethi isn't correct and he had ignored / broken the rules of Election commission and there are chances that there could be an inquiry against Rahul Gandhi. On Thursday VS Sampat had given a statement that on the day of voting at Amethi Rahul Gandhi had visited a minimum of three polling booths and according to the laws there would be an inquire against him and if he is found to be guilty then he could be imprisoned for three months ,charges can be applied or both.